My mom was filled with aphorisms for every occasion. We kids would look up at her, roll our eyes, and think, Uh-oh, here comes another one…. “Into each life some rain must fall!” she would say merrily (for example), tossing her pretty, manicured hand in the air, as if the problem that had just befallen her – a problem that would fell anyone else – was no big deal. She was young, resilient, buoyant. Despite all, she maintained a sense of humor and even a modicum of wisdom. Because her father had been a sailor in the German navy around the turn of the last century who emigrated to the U.S. well before the outbreak of World War I, my American-born mother, his “little princess,” possessed a sheaf of sailing aphorisms too. One of my favorites among her many maxims went like this: If everyone tossed their problems into a big pot and stirred the pot’s contents around with a huge paddle, then, blindfolded, reached in, they’d pull out their own. “Our problems are tailor-made for us!” she’d say, as if this was a plus. Really??? I’d think, ever the too, too serious kid. How awful. But the more I think about it, especially now that I’m several years older than she was when she died at the age of sixty-nine, the more I must agree with her. We are the products of our times and our experiences; we’re shaped by the when and where and what of all we’ve lived through. The books we’ve read, the places we’ve been, the people we’ve met and have been affected by (for good or ill) are among the baked-in ingredients – salty, sweet, sour, bitter, and umami – that comprise who we are as individuals. Deep down, at the spiraling DNA level, we may all be basically the same as human beings. But when it comes to what surrounds all that – the layers of packaging, or, to put it another way, our metaphorical clothing — it’s a different story. Those indelible stories make us who we uniquely are. Lately I’ve been thinking about my own metaphorical clothing, and what’s come to mind is the iconic pea coat – a sturdy, thick, coarse, blue, woolen, double-breasted outer-coat – worn by sailors and fishermen for hundreds of years. The name “pea,” I just learned, comes from a Dutch word (the Dutch are credited with designing the first pea coat in the 18th century) “pij” which means a rough, woolen material. 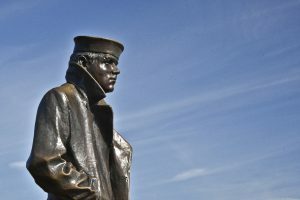 The common denominator for the navies of many countries, including the U.S. Navy, for adopting the pea coat as standard issue was the need for a durable piece of form-fitting outwear that could withstand the harsh rain, wind, and cold temperatures typically experienced out at sea. The wool that pea coats are made of is – still — woven tightly and treated with heat to bind the fibers together, resulting in a very warm, water- and wind-resistant fabric that is perfect for life at sea. My mother dressed us in child-size pea coats when we were kids. They kept us warm during cold winters in New Jersey. Once in a great while I forget and make the grave mistake again of expecting happy friends to understand the unusual events of my life and their permanent effects. I thrust my heavy, scratchy pea coat on them, as if to say, Here, put this on and see how it feels. Naturally, they pull away. They can no more wear my tailor-made, navy-blue, thick wool coat than I can fit into their pretty, pink party dresses. “Just be happy,” they say to me consolingly. “Lighten up! Have fun! Think positive thoughts and everything will be all right.” Words lost to air. It takes a while to accept these realities, to allow for the differences, to respect each other’s otherness. Maybe in my next life I’ll be a beloved princess who wears pink and fluffy clothes. That sounds like fun. But in this one I’m a sailor in a fitted pea coat, hanging to the mast of an old ship, tossed about on uncertain seas. I’m comforted to know, though, that there are other ships out there like the one I’m sailing on. On a clear day I can see I’m not so alone. There is truth to your understanding of our metaphorical clothing…and some sadness in describing yours…very rough cloth indeed. But I suspect underneath the pretty pink party dresses are plenty of hairshirts that are painful indeed, although hidden. Whether in fitted pea coat or pink and fluffy clothes, you remain a much beloved princess for many. Ummmm…..takes one to know one…. Yes, it does. Thank you Shari. Thank you, Carol dear. I hope you’re doing well! I KNEW someone would enlighten me! 🙂 Thank you, Jean-Vi! Thank you so much, Pam. So good to hear from you. I hope all is well with you and family. Yes, true, Barb, programming too. And I’m sure if I had your sweet mom and good dad (etc.) as well, we’d have even more in common. I’m grateful that we have what we have. Bonnie you are not alone! You have a bevy if friends like me who watch for your writings and company . Oh, Jane, your words have given me chills. Thank you so much. I know you know. — Love always. Powerful imagery, Bonnie. Some are never find resilience to weave their pea coat. Their souls freeze and never recover from what life has tossed them. Your words continue to help me wear mine. Well said, Bonnie Fare. Pink ruffles weren’t meant for you, my friend. You’re splendid in your navy pea coat. You’re developing quite the wardrobe, Arti dear! 🙂 So glad you’re wearing a pretty, lighter coat now. — Much love. From one sailor to another, I don’t fit into those frilly dresses either; I’ll take a good old pea coat anytime! And those old maxims, were good ones. And we still abided by the Red skies at night…”. Nice piece Bonnie! In desperation and exasperation at your not receiving my comments, I have unsubscribed and re subscribed under a different email. ¡Ojalá!